This week’s assignment was to mount a motor, and then mount something to that motor. I knew I wanted to use my micro servo motor, and that I wanted there to be an interaction component. I was also interested in using the ultrasonic sensor. The idea for the HANDS-OFF came from the high five game we all learned as kids (high five/ down low, too slow.) I wanted to create a hand that would move away from a person’s hand when they reached for it. I originally planned to buy my motor mount. However, I was gone all weekend, and when I visited Tinkersphere on my way back, they didn’t have the kind of mount I needed. I ended up measuring the servo with calipers and lasercutting a mount out of cardboard. It took a few tries to get the tolerance right. I then laser printed five pieces to create a box that I could attach the mounted servo to, and that would tidily enclose the arduino and sensor. I also laser printed the arm and hand. 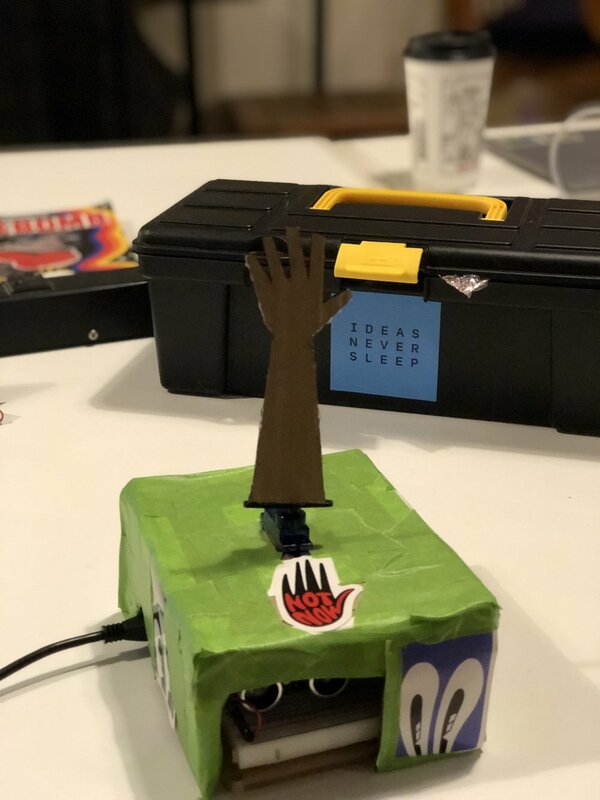 I bought extra attachments for the servo, and chose to hot-glue the cardboard hand to the attachment. The cardboard box didn’t look very inviting or interesting, so I wrapped it in green duct tape and added some stickers.